Every year we take a family trip camping in the Smokies. Each year we add a few new pieces of camping gear to make our trip more comfy. This year, I focused on finding the perfect sleeping bags for camping. Our kids already had sleeping bags but my husband and I didn’t. We just used bedding from home but I don’t like lugging that around and it doesn’t pack up as conveniently as sleeping bags. I didn’t want any old sleeping bags. I wanted the perfect sleeping bags for camping for us. When I found my perfect picks, Coleman provided samples in order to facilitate review. Our annual family camping trip does not involve hiking and then camping so we weren’t looking for tiny sleeping bags. We take day hikes from our drive up camping spot in the Smoky Mountains so I was looking for sleeping bags for camping that offered comfort. For me, I found an amazing memory foam sleeping bag and for my 6 foot 4 inches husband, I found a big tall sleeping bag. I love my memory foam mattress at home so I knew I would love the Coleman memory foam sleeping bag. This synthetic sleeping bag has a layer of memory foam for luxurious camping comfort. You will love this extra layer of comfort between you and your sleeping pad when you are in your family tent. Meant for 30- to 50-degree nights, this rectangular bag is roomy in the legs and supremely comfortable. It is fleecy soft inside and it rolls up and ties with attached cords. My daughter had a big sleepover party and one of her guests borrowed it for the party. She told me the next day that it was the most comfortable sleeping bag she had ever used. She said lots of the girls were sitting on it with her during the movie because it was so comfy. I mean, really, a memory foam sleeping bag is pretty sweet! I also love the snag-free zipper and the handy hidden pocket. • Rectangular sleeping bag, 75 x 33 in. My husband is a tall man (6 foot, 4 inches) so thought I better find him a sleeping bag made for tall people so that he would actually stay covered instead of sticking out at the top! I was happy to see that Coleman has a new BIG-N-TALL 30 Sleeping Bag that is just right for him. The Wrap and Roll attached cover makes it easy to pack up and the Dura-Tough tarpauline bottom resists water is great for durability. The sleeping bag is plenty long for my husband and the wide rectangular shape gives him plenty of room to move around. 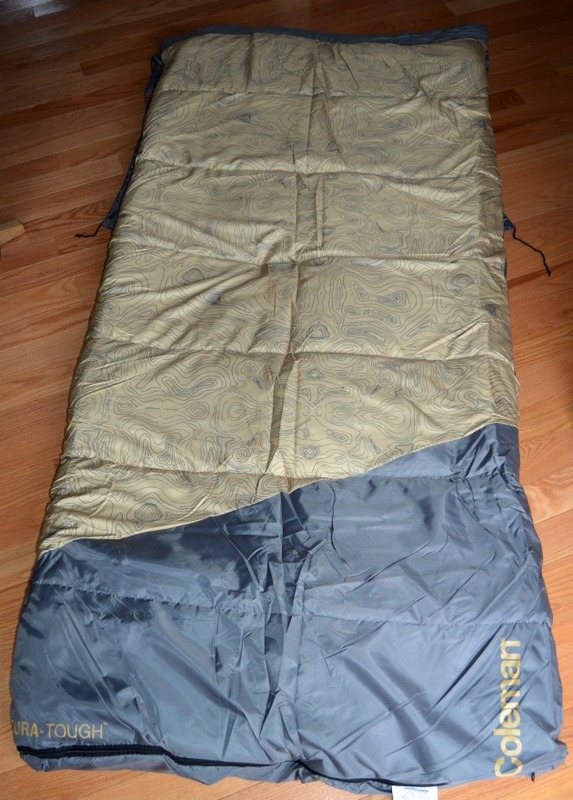 • Rectangular sleeping bag, 84 x 40 in. So which sleeping bags for camping appeal to you the most? The big tall sleeping bag or the memory foam sleeping bag? You may also enjoy this article on how to go camping. The 2-BURNER CAMO SERIES STOVE caught my eye and would be great for camping. DURAREST ELITE EXTRA HIGH AIRBED – TWIN looks good. 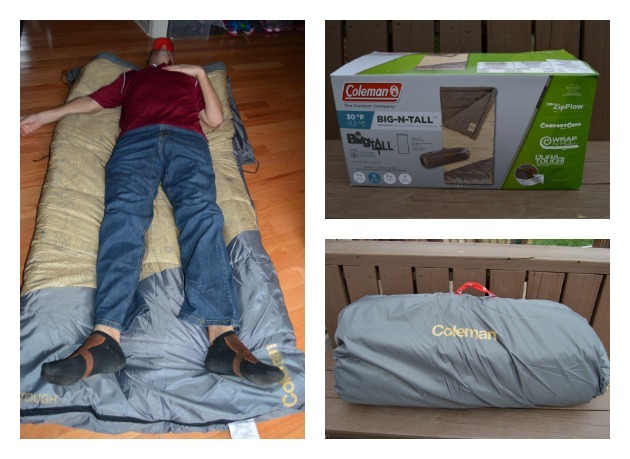 I like the Coleman Big Tall Sleeping Bag! I didn’t know they made this size! It would be perfect for my husband! Another product from Coleman I really like is the COLEMAN® PATIO SLING CHAIR. The Pack-Away™ Outdoor Picnic Set For 4 caught my eye! That would be nice to own! I have my eye on the 100 quart cooler. It would be perfect for camping. I would love the Coleman Comfort Cloud 40 Sleeping Bag, the memory foam sounds amazing! My son and his wife love camping. They would like the 2 FOR 1 ALL DAY DOME 4 tent. From the Coleman website, I like the Echo Lake™ Fast Pitch™ 8-Person Cabin with Cabinets. I’ve ALWAYS wanted to go camping! I’m going to be 27 years old this year and I’ve never gone legitimate camping before. I’d love to be able to change that and go this year so I’d definitely like to invest in something like the arlsbad™ Fast Pitch™ 6-Person Dome Tent with Screen Room! We would have to have the Big-N-Tall. Nuff said. Thanks for the opportunity to win. I like their 16 qt wheeled cooler and the Big-N-Tall Sleeping Bag. I could really use a ALL NIGHT™ 13 X 13 INSTANT LIGHTED EAVED SHELTER for my family. I love that camo stove, looks awesome! Thank you!! The 2-MANTLE INSTASTART™ QUICKPACK™ LANTERN & also the PRAIRIE BREEZE™ CABIN TENT caught my eye. Would love to try & go camping with these & more items. My family definitely needs ASPEN MEADOWS™ 30 BIG & TALL SLEEPING BAG. we are Big & somewhat Tall. I like the road trip beach shade. I am in love with the Portable Stove Oven Combo and would love to win this as I am the grill mistress and my wings are the best in NJ. I love to go camping and need a portable stove oven combo to cook my steaks, burgers, pizza, chicken wings, veggies, etc! I love the fact that I can create three different dishes at the same time! Winning! Quick pack lntern I need one!! The QUICKBE SINGLE HIGH AIRBED – FULL caught my eye and it would go great with the memory foam sleeping bag. It wouldn’t make camping all that more comfortable. I would love the Coleman memory foam sleeping bag myself! Love the lanterns and coolers! DURAREST ELITE EXTRA HIGH AIRBED would be nice to sleep on in the tent. The 10 FT. X 10 FT. LIGHTED INSTANT CANOPY would be great for tailgating. I love the memory foam sleeping bag for me and love the big and tall for my husband. I love the 4 in 1 dome tent! We go camping every weekend and a nice tent is a must have. I need me a camp wagon! I would also love to get the CAMP PROPANE GRILL for my hubby! Thanks for an awesome giveaway! The Coleman Comfort Cloud 40 Sleeping Bag sounds perfect for me or my grandchildren. 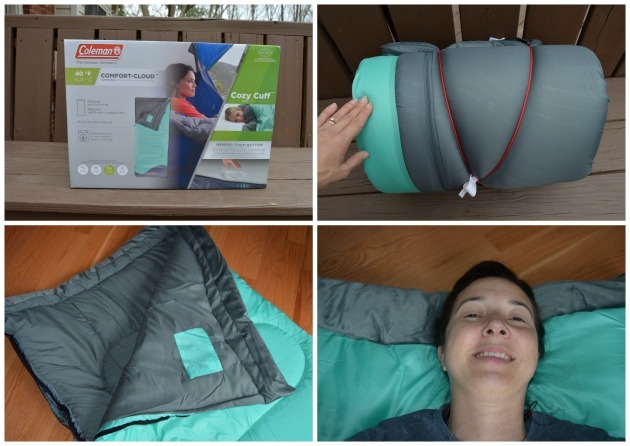 I would love to win the Coleman Comfort Cloud 40 Sleeping Bag . It would be prefect for me for camping. We have lots of great Coleman stuff in our camping gear. The Converta Cot caught my eye….for a little comfort camping! I would like the Coleman Comfort Cloud 40 Sleeping Bag! It looks nice and warm, and I love the colors! Thank you for the chance to win! The Camp Cooker looks cool. The games caught my eye. I’d love to have a Ladder Ball set to take camping! I would like to have the Kickback Breeze chair. My favorite sleeping bag is thee memory foam. I LOVE the Big Game Sleeping Bag. Cool that it even comes with a matching pillow. I also really love the 2-in-1 Utility Light! Thank you for your giveaway! We really need the 120 QUART XTREME® 6 COOLER. I would love to own the Coleman Memory Foam Sleeping Bag! It sounds like it would be a very comfortable camping experience! My son is 6’5″…I need that Big and Tall sleeping bag! the Big and Tall one looks nice! I like the Pitch It Tent so easy to set up. The Big an Tall Sleeping Bag is my Favorite. I like the Coleman Steel Creek Fast Pitch 6 person dome tent. The selling point was the screen room where I can watch nature in a critter free space. The ECHO LAKE™ FAST PITCH™ 8-PERSON CABIN WITH CABINETS caught my eye. I like the Coleman Comfort Cloud 40 Sleeping Bag. It look warm and comfortable. We could really use a fast pitch tent and some new sleeping bags! So many wonderful and lovely product that I love my favorite is 2 FOR 1 ALL DAY DOME 4! Thanks for the awesome chance 🙂 Good luck everyone. BIG GAME™ SLEEPING BAG and I would love the inflatable camping pads. Hubby would love a sleeping bag for tall folks! DURAREST ELITE EXTRA HIGH AIRBED caught my eye. Thanks for the chance. Love Coleman – great products. We love Coleman product for our camping trips, they have the best quality products. I would love to have http://www.coleman.com/stoves/dual-fuel-powerhouse-2-burner-stove/3000003655.html#start=5 stove as we don;t have our anymore and will soon be replacing it with this one! My heart is yearning for the Cat Iron Dutch oven- a great way to cook some hearty stews while camping out. I would Love the YARBOROUGH PASS™ 6P FAST PITCH™ TENT. The Elite PerfectFlow™ InstaStart™ Propane Lantern would be useful both for camping and for any time the power is out at home. I love the Big Game Sleeping Bag. I love the size and it comes with a pillow and it looks comfortable. I really like cooking outside, I like the Cast Iron Dutch Oven. I also like the 120 quart Extreme cooler and the 2 for 1 All Day Dome 4 tent! I would love to win the Coleman Comfort Cloud 40 Sleeping Bag. It sounds like it would be so comfortable. We could really use the Pack-Away Outdoor Folding Table to set up our camp kitchen. I would love the Coleman BIG-N-TALL sleeping bag. I like a bigger sleeping bag. My husband might just fit in the Coleman® Dexter Point™ 30 Sleeping Bag. Loving the Big Game™ Sleeping Bag! I love the 50 Quart Wheeled Xtreme® 6 Cooler! The big n tall sleeping back would be perfect for my 6′ 2″ son. The Elite® WeatherMaster™ Screened 6 Tent would be really great for my family when we go camping. I would love to win the sleeping bag for my grandson, he wants to go camping this summer and it would be perfect.! the comfort cloud sleeping bag sounds amazing. Sounds like one I really would enjoy! My husband would love the 60 QT PERFORMANCE WHEELED COOLER – DALLAS COWBOYS. Used Coleman equipment for years but could really use a new sleeping bag! I bought Coleman sleeping bags 30 years ago and we are still using them. I would like to win the Coleman Comfort Cloud 40 Sleeping Bag. It looks comfortable. I like the Coleman Memory Foam Sleeping Bag you highlighted. It sounds dreamy. And on the Coleman website, their 8-Person Instant Tent is something I would like to add to my future camping experiences. I love the convenience of a good big n tall bag, and the Coleman brand has always had reliable quality. The COLEMAN® 8-PERSON INSTANT TENT caught my eye. How neat! The Coleman Memory Foam Sleeping Bag would be nice to have. the big and tall one, my husband and son both 6’4″…. I think I would need to choose the comfort cloud…I am all about comfort when I sleep. 🙂 Thank you. The Big Basin extreme weather sleeping bag is awesome. I like that it can be used on nights colder than 15 degrees. Would love to have the Prairie Breeze Cabin Tent. Our family of 6 would all fit! I like the BIG-N-TALL™ QUAD CHAIR, my husband is quite tall and this would be great for him. I also love the Coleman BIG-N-TALL™ QUAD CHAIR for camping gear. I would love to have the ELITE SUNDOME 6-PERSON TENT! I would definitely use the comfort smart cot. And the comfort cloud 40 sleeping bag sounds delightful. I`d love to try the Coleman Memory Foam Sleeping Bag! Sounds comfortable! Love everything coleman we`ve ever used for camping. New to the sleeping bags available. I would love to have the GRILL PPN ROADTRIP LXE BLACK and the COFFEEMAKER PPN W/CASE RED. I would love to get their 1 MANTLE KEROSENE LANTERN, ROUNDED GLOBE. I want the 2 FOR 1 ALL DAY DOME 2 tent! i CANT WAIT TO USE THIS WHEN I WIN. My daughter bought a Coleman tent similar to 3-PERSON INSTANT DOME TENT and they love it. Definitely love the sleeping bags but the Air Beds have been on top of our want list! Comfort Cloud memory foam sounds awesome! I would like to win the Coleman BIG-N-TALL™ 30 Sleeping Bag. My husband is tall. The parkas & the 15 ft. x 13 ft. Screened Canopy caught my eye. We do own a Coleman cooler, tent, and sleeping bag. Great quality products!! The camping gear that caught my eye is the Elite Sundome 6-Person tent. We have a large family and we need a roomy tent like this one. Coleman Big Tall Sleeping Bag Would really be nice to sleep without feeling like i’m all scrunched up and not able to breathe. I really like the marine cooler it would be perfect for our boat. I would love the Memory Foam Sleeping Bag . It looks so comfy and perfect for camping out. I would also love to have their Pack-Away Deluxe Kitchen. That would come in super handy during camping trips. I also like their 2 in 1 Utility Light. 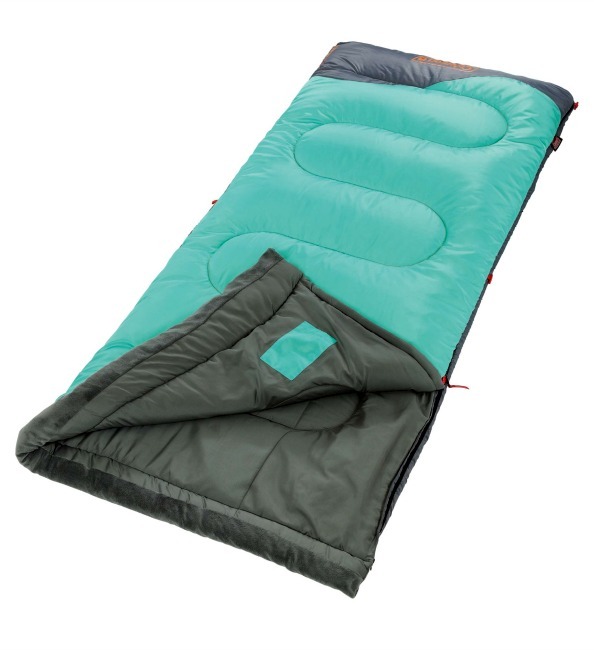 The Coleman Comfort Cloud 40 Sleeping Bag looks very comfy while being light weight. Thanks. I’d like the Coleman Memory Foam Sleeping Bag. Would make the hard surfaces much easier to tolerate I think. I would love a sleeping bag with memory foam! Decadence! My husband and I both need new sleeping bags, so I’d love to win the Big & Tall one for my husband. I’d give it to him for Father’s Day. I think the Memory Foam sleeping bag would be nice to have. I love the Coleman Comfort Cloud 40 sleeping bag and the Coleman 10 can rugged lunch box. 2 FOR 1 ALL DAY DOME 2 I love this style even for the beach to have shade there and a place to change clothes. The Echo Lake Fast Pitch 6-Person Cabin with Cabinet tent caught my eye. I like the Coleman Comfort Cloud 40 Sleeping Bag because of the memory foam due to neck and back issues. I really like the Coleman CPX 6 Multi-Purpose 190L LED Lantern! I also like the Coleman Comfort Cloud 40 sleeping bag! Reading your review and looking at Coleman products makes me wanna be camping and fishing right about now! My 15 year old is already 6 feet tall and has outgrown the “adult” Coleman sleeping bag I purchased for him for Boy Scout camping trips, so the “Big and Tall” bag is something I really need to look into! The rugged 6 piece family cook set would be great to have. I don’t have much for kitchen gear yet. Thanks. I would love to get the montana 6 tent. it would be awesome to take on our next camping trip. The TENAYA LAKE™ 6P FAST PITCH™ CABIN WITH CABINETS would be great while out camping! I like the PRAIRIE BREEZE™ CABIN TENT. Very cool design! The 100 quart cooler would be perfect for us. We love going fishing and then cooking out. The Coleman Comfort Cloud 40 Sleeping Bag would also be great. I like the Echo Lake™ Fast Pitch™ 6-Person Cabin with Cabinet, my old tent showing its age. I like the portable camping stove oven combo. 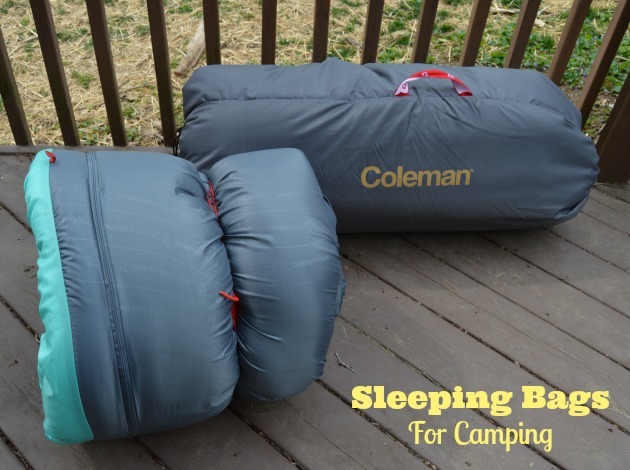 Would love to win the Coleman BIG-N-TALL 30 Sleeping Bag ! The 16 qt wheeled cooler would come in handy all summer long for me!